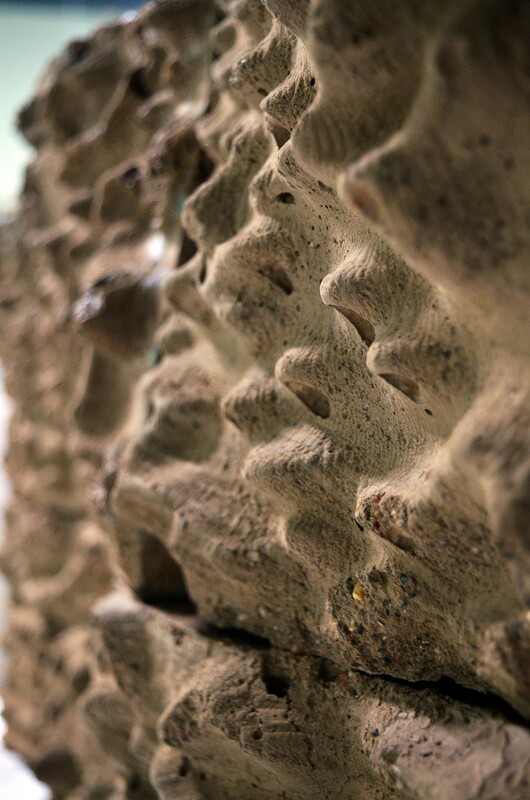 About 8 to 15 percent of the world’s carbon dioxide emissions are attributed to concrete manufacturing, which is widely used in construction. The building industry hence continues to be one of the largest contributors to global warming and climate change. In addition, concrete from demolished buildings, adds to the particulate pollution and is dumped into landfills as it lacks a direct material value. 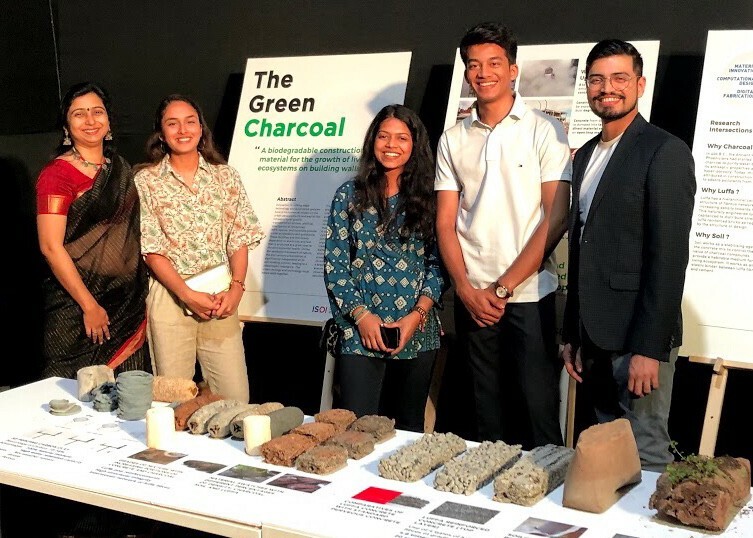 The Green Charcoal is a practice-based research at the intersection of material innovation and technology that addresses the issue of rising pollution and temperature by developing healthy materials for building construction. 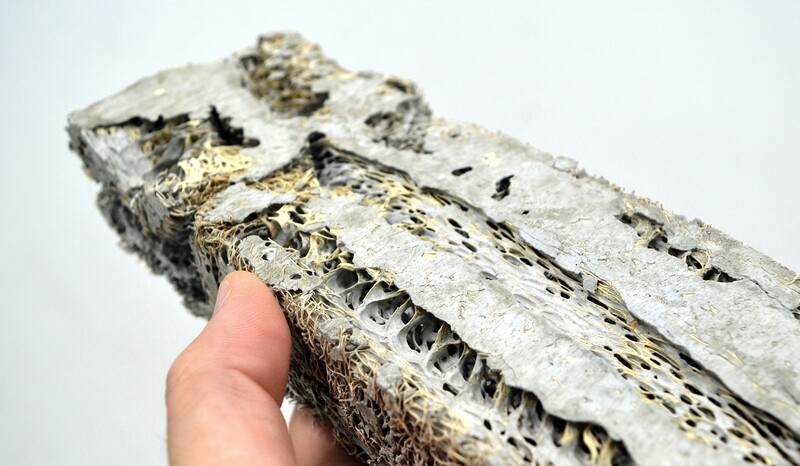 It is the development of cutting-edge materials for construction made up of charcoal, organic luffa fibres, soil and air to create a built system that is biodegradable, lightweight and allows the growth of living ecosystems of plants and insects on its surface. 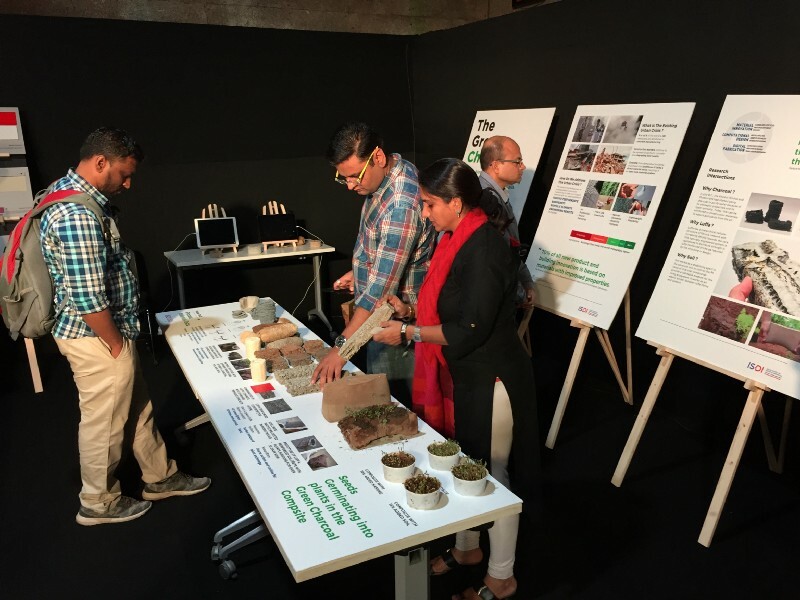 This is aimed at creating a breathing state of architecture to ensure increased biodiversity in cities while providing healthy urban solutions for people. In biophilic spaces, people are happier, patients recover faster, students learn better, retail sales are higher, workplace productivity goes up, and absenteeism goes down. If the facades of buildings, compound walls and dividers that follow the road network are built using the green charcoal bricks, they will not only clean the air or control rise in temperature but will also inspire a positive social behaviour. How does it make the world a better place to live in? 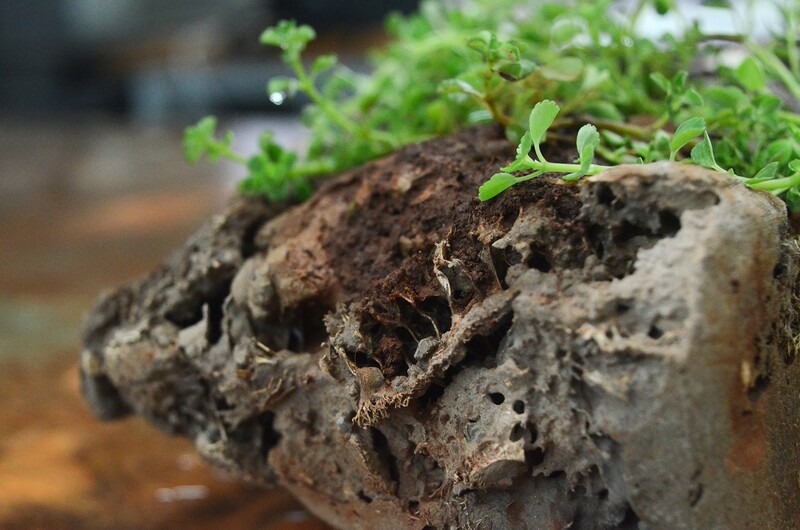 World of better climate — The bio-brick allows biodiversity of plant and insect species, passive cooling of interior environment and purifies the air. World of a better economy — The aggregate used in the constitution is sourced from see beds and is getting increasingly scarce and expensive. The green Charcoal material composite has a 90% reduction in the use of coarse aggregate, 4% reduction in cement, 4% reduction in fine aggregate, 21% increase in air pockets. 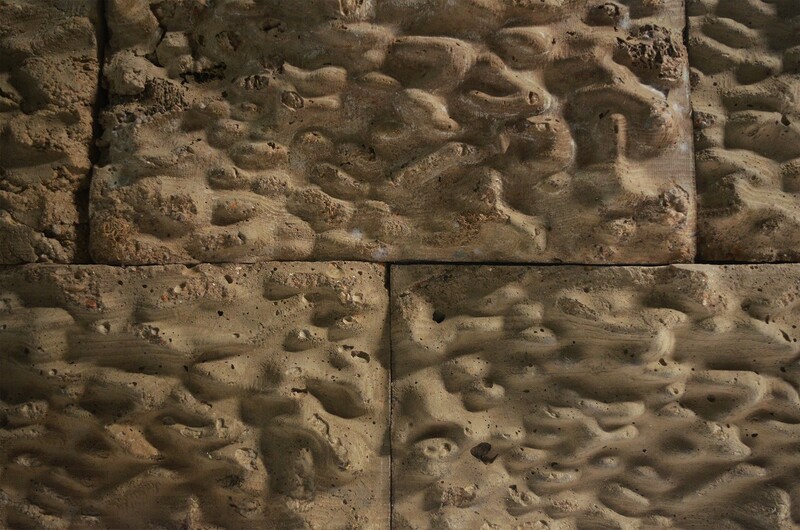 Effectively it has a 54% increase in organic matter as compared to a standard concrete block. How does the materiality work? The green charcoal brick replaces metal reinforcements found in standard RCC with Luffa’s fibrous network, which provides strength, appropriate flexibility and ensures a high porosity. 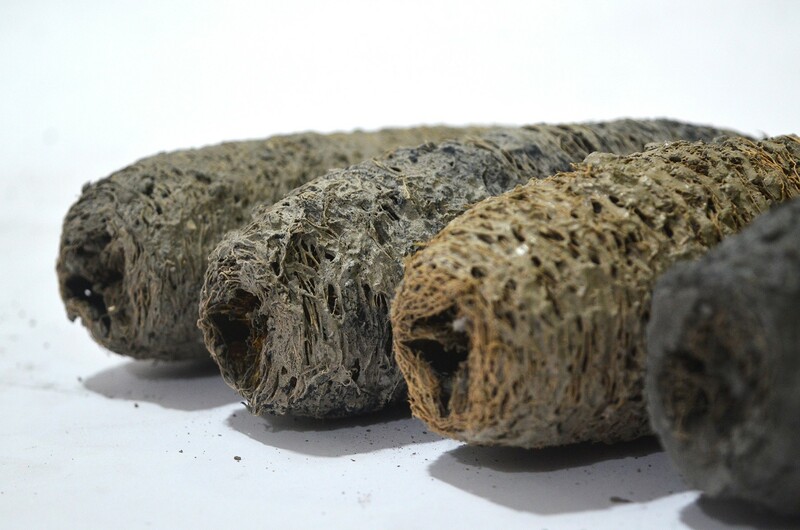 These luffa pores provide anchorage for plants and act as thousands of tiny water tanks reducing the temperature of the brick thereby cooling the interior environments. One of the component of the biodegradable brick mixture — charcoal being an adsorbent of nitrates, is used in small portions on the surface. This creates a co-dependent system where the charcoal adsorbs impurities from the air that serves as nutrition for the plants to feed on. We are exploring different types of surface treatments that our biobricks can have. 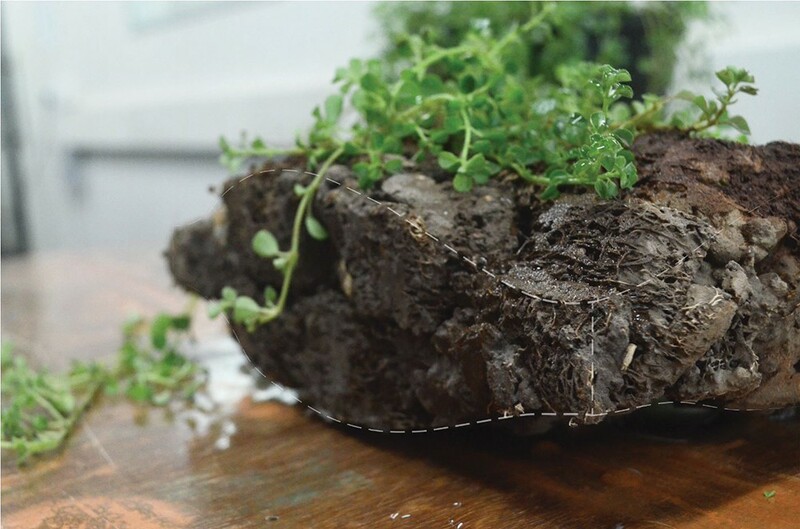 These organic undulating surfaces are aimed to facilitate better anchorage for plant roots and also to guide them to grow in a certain fashion. This gives people a sense of material connection with nature which is comforting and a visual connection with natural patterns that are stimulating. 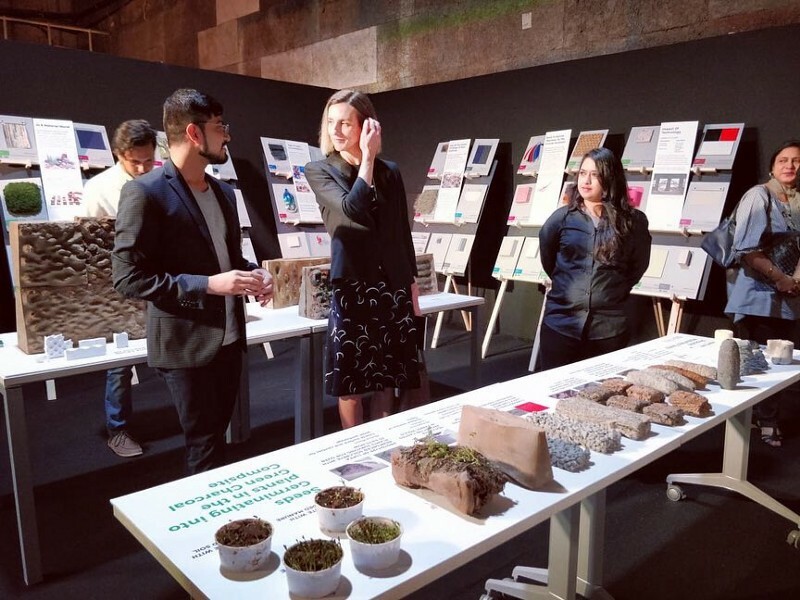 Backed with scientific studies, The Green Charcoal research continues to explore biophilic material compositions, climatic performance, natural colour palettes and patterns to make the future cities a healthier and happier place to live in. 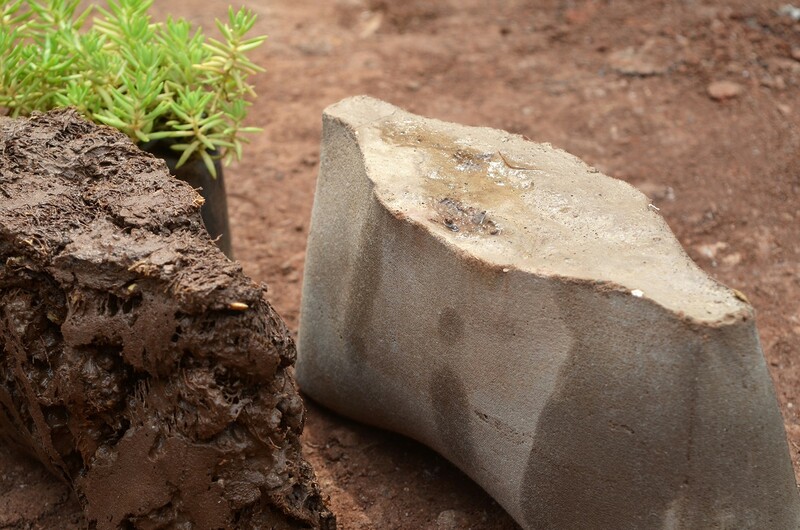 One of the Green Charcoal soilcrete bricks was crushed to test if new plant life can grow in it at the end of a building’s life cycle. 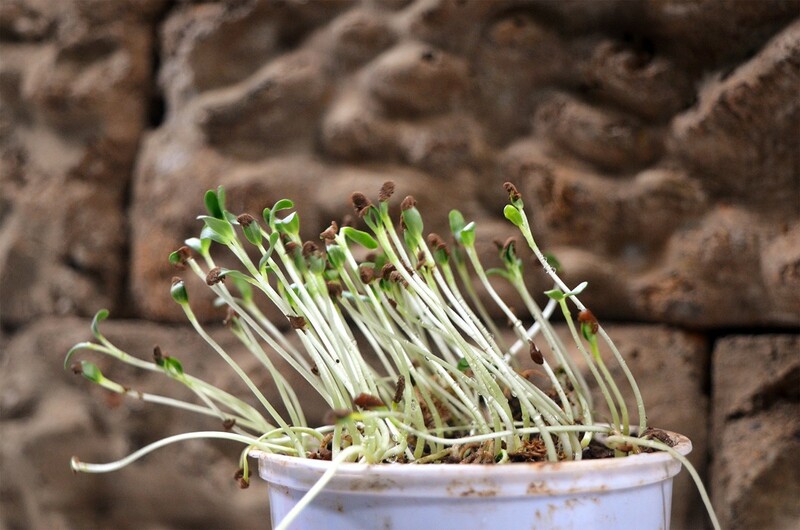 The right image shows seedlings germinating in the green charcoal mixture representing a cradle to grave material life cycle. 1st and 2nd December 2018, Mumbai. 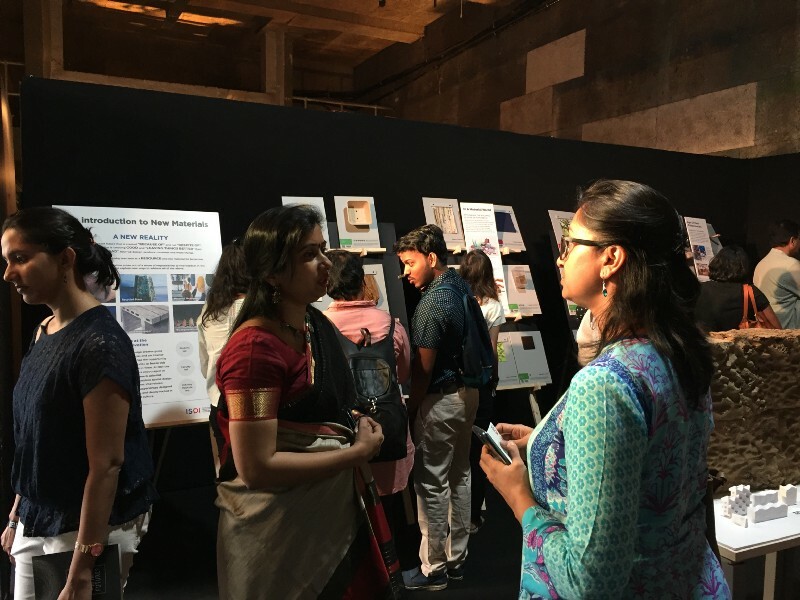 The New Materials Library at ISDI provides a platform to discuss questions of sustainability of the world through the lens of material design and material systems which are practised in the local, national and the global societies. 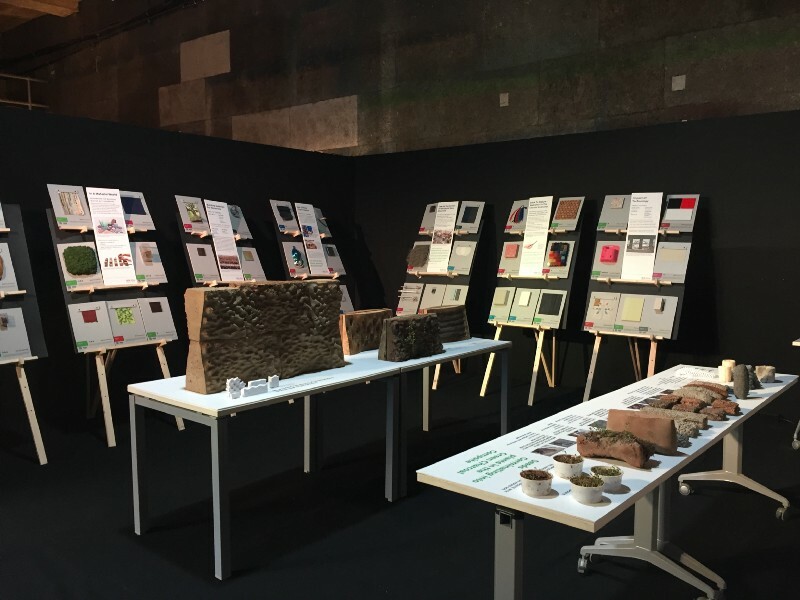 It develops narratives to be taken further as practice-based research or research by making at the intersection of design, science and ecology. 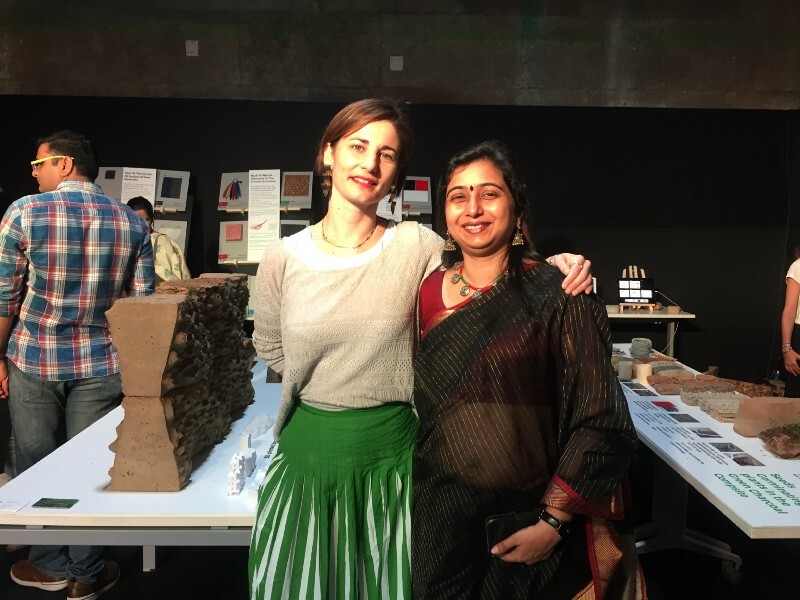 The core objective of the material research lab is to inform design led opportunities which inquire and implement how materials can be used in more sensitive and meaningful ways. This is aimed to form new intellectual collaborations between the academics and the industry for developing cutting edge solutions towards sustainable futures. 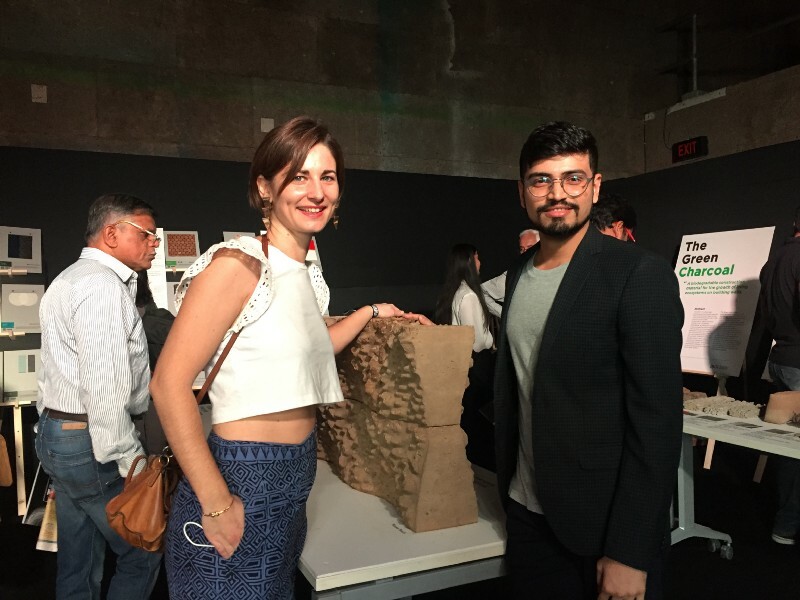 The Ethos of the New Materials Library and The Green Charcoal, which is faculty-led research under this research cell was exhibited at the Future of Architecture and Building Biennale, Mumbai 2018. Process Prototype — Exploration of different percentage of charcoal and concrete to test adsorption, porosity and strength of the mix.